Williams College - Christmas Brook Culvert Replacement Project - J.H. 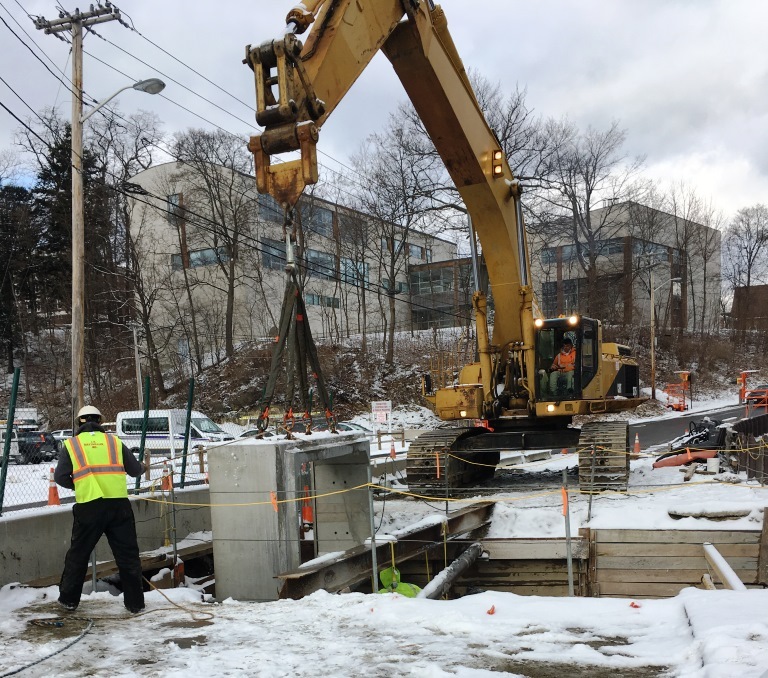 Maxymillian, Inc.
Maxymillian completed a complex, three phase installation of a 1,200 lineal foot concrete drainage culvert in a busy downtown section of the Williams College campus. The existing Christmas Brook culvert under Latham, Meacham, and Water Streets was abandoned and replaced with 166 new concrete culvert sections weighing 36,000 pounds each. Given the project’s extensive excavation activities, at depths ranging from 14’ to 20’ deep, Maxymillian designed an earth support system that slid along with the flow of construction to speed installation time. Installation started at both ends of the site and met in the middle, which resulted in cutting the install time in half. Maxymillian worked closely with College and Town officials over this 12-month project to meet critical milestones and ensure minimal disruption to students, homeowners, and traffic flow. Maxymillian is an award-winning heavy civil and environmental construction firm serving the Northeast region since 1969. © 2018 Maxymillian, Inc. All Rights Reserved.